From the first days of acquiring of Independence special attention is paid to educational sphere by the President of the Republic of Uzbekistan. As a result of it today our students have possibilities to get education, meeting the world standards, and teachers – to give students quality education and continuously raise qualification. It is the certificate of that laws «On education» and «The National program for personnel training » are successfully realized. The decrees of the President of Uzbekistan, accepted in the latest years and having great value for education system development such as № 1533 «On measures of strengthening of financial – technical base of higher educational institutions and improvement of quality of training of highly qualified personnel», № 1875 «On measures of further improvement of foreign languages learning system», the Decree № 4456 «On further improvement of system of training and certification of qualified scientific and scientific – pedagogical personnel», the decision of the Cabinet of Ministers № 371 “On introduction of system of rating assessment of higher educational institutions of the Republic» put big responsible problems before each employee of education system. 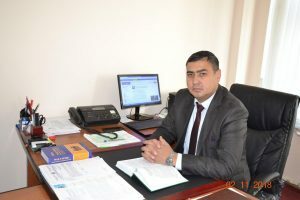 The staff of Karakalpak state university with great responsibility and understanding refer to problems, following from solving of these important documents. Now at university there are 9 faculties, a magistracy department and 41 departments, 625 teachers, students are trained in 47 directions of education of bachelor degree and in 20 directions of education of magistracy. There are 3 academicians, 40 Doctors of sciences and professors, 242 Candidates of sciences and senior lecturers in professorial-teaching staff. During the latest years at university 7 new educational directions of baccalaureate, 3 new majors of magistracy were opened. The quality and volume of training in directions of oil and gas refining, technology of processing of production of chemical and light industry, , ichthyology and electric power industry essentially raised. In 2012-2013 academic year in 37 educational directions of baccalaureate, in 19 educational directions of magistracy 1610 students graduated. Last year 2 students became winners of state stipends of the President of the Republic of Uzbekistan, 2 students became winners of the state award «Zulfiya», there are winners of the «Nikhol» award, winners of the state stipends named after Ulughbek, Navoi and Berdakh. In 9 lecture halls videoprojectors are installed, conditions for use of modern information and pedagogical technologies at lectures are created. And also 7 lecture halls are equipped by cameras of video observation. Now in academic-methodical department are employed: the head of the department, 5 methodologists and 3 dispatchers. It is necessary to notice that reforms carried out by the state in spheres of education are directed to creation of relevant conditions for acquisition of profound knowledge and practical skills on speciality. Our purpose is to give the youth the chance to use knowledge and skills effectively for welfare of Motherland.